The Sutra of Perfect Enlightenment Buddhist Sūtra, original Chinese title is Yuanjue jing, Japanese Engaku-kyo; 1 fasc. (T 842.17.913a-922a). Full title Dafangguang yuanjue xiuduluo liaoyi jing. A Chinese Mahāyāna sutra which was probably written in the early eighth century C.E. Divided into twelve chapters as a series of discussions on meditation practice, this text deals with issues such as the meaning and origin of ignorance, sudden and gradual enlightenment, original Buddhahood, etc. all themes which were originally elucidated in the Awakening of Faith. It was intended to resolve questions regarding doctrine and meditation for the earliest practitioners of the Chan school. 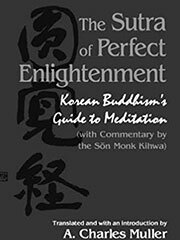 The Sutra of Perfect Enlightenment is arranged in twelve chapters, plus a short introductory section. The introductory section describes the scene of the sermon and lists the major participants. The location is a state of deep meditative concentration (samadhi) and the participants are the Buddha and one hundred thousand great bodhisattvas, among whom twelve eminent bodhisattvas act as spokesmen. Each one of the twelve gets up one by one and asks the Buddha a set of questions about doctrine, practice and enlightenment. The structure of the sutra is such that the most «essential» and suddenistic discussions occur in the earlier chapters and the more «functional» and gradualistic dialogues occur later. This kind of structure reflects a motif associated with the doctrine of the Huayan school (華嚴宗), which affirms that the Buddha delivered the abstruse Avatamsaka Sutra (華嚴經) as his first sermon, in an effort to directly awaken those whose «roots of virtue» were well-matured. The terminology that Zongmi (宗密) and Gihwa (己和) use to describe these advanced practitioners is that they possess the capacity for the teaching of «sudden enlightenment»—a direct awakening to the non-duality of reality, which necessarily precludes gradualist, «goal-oriented» practice. In the first two chapters (the chapters of MaĆ±juśrī and Samantabhadra), the Buddha holds very strictly to the sudden position, denying the possibility of enlightenment through gradual practice. In the third chapter he begins to allow for a bit of a gradual view, and the next several chapters become mixtures of the two. The final few chapters offer a fully gradualist perspective. Gihwa’s primary means of categorization of the chapters is according to the «three capacities» of practitioners: superior, middling and inferior. According to Gihwa, the first three chapters are aimed at those of superior capacity, the next seven for those of middling capacity and the final two for those of inferior capacity. However, this method of categorization does not necessarily mean that the later chapters become gradually easier to read and understand. In fact some of the most difficult discussions come in the later chapters. Most notable in this regard is the discussion of the «four traces» of Self, Person, Sentient Being and Life in Chapter Nine. Since the distinction between each of these four is extremely subtle, and the wording of the text itself is not that clear, this turns out to be one of the most difficult chapters to digest.